The calendar has turned to a new page, and it's now National Ice Cream Month. As ever, it's worth honoring all of America's made-up food holidays because it usually means you're getting free food. And guess what? This is no different. On July 1, you can stop by any participating Baskin-Robbins and get yourself a free mini-slice of ice cream pizza. Yup. Free ice cream pizza for nothing more than having access to a Baskin-Robbins. And no, ice cream pizza isn't some horrible Frankenstein's monster of food you forgot to put away when you got hungry last night. It's ice cream on a cookie crust cut into the shape of a pizza. 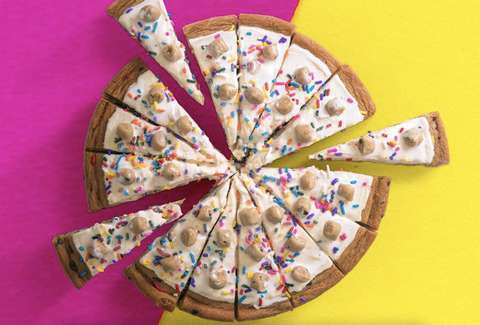 This year, Baskin-Robbins is giving out Chocolate Chip Cookie Dough Ice Cream Pizza. The world's largest ice cream specialty shop will have the deal available from 3-7pm local time across the US. And that's just one of the ways its choosing to celebrate National Ice Cream Month and its pinnacle, National Ice Cream Day on July 15. On ice cream's holiest day, you can get buy-one-get-one-free ice cream cones, buy-one-get-one $0.99 sundaes, and $2 off medium milkshakes if you download the Baskin-Robbins mobile app. July is here and it has more free ice cream than your doctor probably recommends.